The 2009 Champion Hurdle featured 23 runners – the largest field since Morley Street beat 23 rivals in 1991 – including the winners for the previous five years. Binocular, trained by Nicky Henderson and ridden by A.P. McCoy, started 6/4 favourite, but was upstaged by stable companion Punjabi, ridden by Barry Geraghty, who was all out to win by a head from Celestial Halo, with Binocular a neck back in third. Katchit fared best of the previous winners, finishing a never-nearer sixth, beaten 5¾ lengths. Defending champion Master Minded, still only a 6-year-old, came into the race on the back of easy wins in the Tingle Creek Chase at Sandown and the Victor Chandler Chase at Ascot and was sent off at prohibitive odds of 4/11 to retain his crown. His supporters never had an anxious moment, though, as he went clear to beat Well Chief by 7 lengths, with Petit Robin 2 lengths back in third. Newmill, the 2006 winner, finished fourth at odds of 100/1. Big Buck’s – complete with that annoying, and unnecessary, apostrophe – made his first appearance in the Ladbroke World Hurdle, having been put back over the smaller obstacles after falling at the final fence in the Hennessy Gold Cup. The move proved to be a stroke of genius by trainer Paul Nicholls, because the 6-year-old stayed on gamely to beat Punchestowns and Powerstation by 1¾ lengths and 17 lengths. 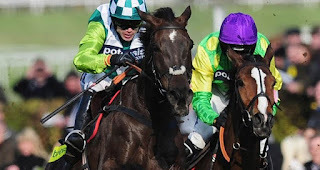 The 2009 Cheltenham Gold Cup was billed as Kauto Star versus Denman, round two, but this time it was the 2007 winner, Kauto Star, who served it up to his ailing stable companion, winning impressively by 13 lengths. To be fair, Denman was having just his second start back after treatment for an irregular heartbeat, but Kauto Star, nevertheless, became the first horse in the history of the race to regain his crown after being beaten in a previous renewal. Defending champion Sublimity was back for another crack, but was beaten early on the run-in as Katchit, an impressive winner of the Triumph Hurdle at the previous Festival, and Osana, who’d won the International Hurdle at Cheltenham the previous December, fought out the finish. It was Katchit who prevailed by a length, all out, to record a first victory in the race for trainer Alan King and jockey Robert Thornton. 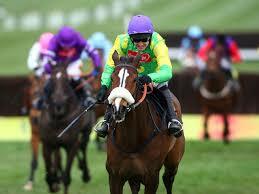 Favourite Sizing Europe weakened quickly and was virtually pulled up on the run-in. The second day of the 2008 Cheltenham Festival was cancelled due to stormy weather and, in particular, high winds, which made areas of Prestbury Park unsafe for racegoers. Consequently, the Queen Mother Champion Chase was run as part of a 10-race card, arranged over five and a quarter hours, on Thursday. However, the race was worth the wait, with the favourite Master Minded putting in a breathtaking display and cruising to victory by 19 lengths. In so doing, he became the first 5-year-old ever to win the race. Defending champion Inglis Drever, who’d also won the race in 2005, started 11/8 favourite and duly completed a hat-trick with a narrow, but ultimately fairly comfortable, win over French raider Kasbah Bliss. The field also feature 2006 winner, My Way De Solzen, who was fifth, and Hardy Eustace, winner of the Champion Hurdle in 2004 and 2005, who finished a well-beaten twelfth of the 15 finishers. Kauto Star, trained by Paul Nicholls and ridden by Ruby Walsh, was once again all the rage, backed into 10/11 favourite, to win his second consecutive Gold Cup. However, his nearest market rival, and stable companion, Denman, had other ideas, taking the race by scruff of the neck and going clear after the fourth last to win comfortably by 7 lengths. 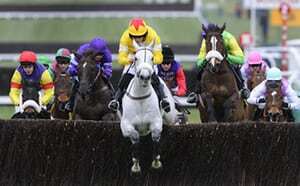 Neptune Collonges finished third, just a short head behind Kauto Star, to complete a Nicholls’ 1-2-3. The 2007 Champion Hurdle produced a minor shock, with 16/1 chance Sublimity, trained by John Carr in Co. Kildare and ridden by Philip Carberry, lowering the colours of reigning champion Brave Inca in emphatic style. Under a waiting ride, Sublimity was produced at the last flight and was soon well in command, winning by 3 lengths. Favourite Detroit City, bidding to emulate 2003 winner Rooster Booster for the same connections, was never going well and trailed in sixth, beaten 18¾ lengths. Defending champion Newmill was back again, at a much shorter price than the previous year but, having helped to set a furious pace, was a spent force approaching the final fence, while favourite Well Chief crashed out at the just the second fence. Voy Por Ustedes, trained by Alan King and ridden by Robert Thornton, took full advantage, rallying to beat Dempsey and River City by 1½ lengths and 5 lengths, at odds of 5/1. For the first time in six years, the Stayers’ Hurdle was missing Baracouda, the winner in 2002 and 2003 and runner-up in 2004 and 2005. In his absence, 2005 winner Inglis Drever landed the spoils, but not without a ding-dong struggle with runner-up Mighty Man, who chased the winner all the way up the hill, but was eventually beaten three-quarters of a length. Blazing Bailey finished third, another 4 lengths way, while favourite Black Jack Ketchum fell at the third flight. The 2007 Cheltenham Gold Cup featured the first appearance in the “Blue Riband” event of Kauto Star, who’d fallen at the third when favourite for the Queen Mother Champion Chase in 2006. Sent off a hot favourite at 5/4, the 7-year-old looked poised for an emphatic victory when clouting the last, but recovered and stayed on strongly to beat Exotic Dancer by 2½ lengths. Having already won the Betfair Chase at Haydock and the King George VI Chase at Kempton, Kauto Star collected a £1 million bonus offered by betting exchange firm Betfair.